This is a proposed curatorial venture, for an exhibition for female graphic designers from the Dada period of art history. The European Dada movement (1916 – 1935), like its predecessors, was male dominated; the Dada championed female rights yet they hypocritically excluded all female artists of the time from their biographies and manifestos. However, the Dada did comprise of some iconic female artists who were mentioned or acknowledged only as sisters, wives or girlfriends of the famous Dada men. This curatorial proposal is an homage to the exceptional work done by these women who lived in a time of chaos and disillusionment but still managed to express their opinion and create a niche for themselves. This project involved research into the history of graphic design. 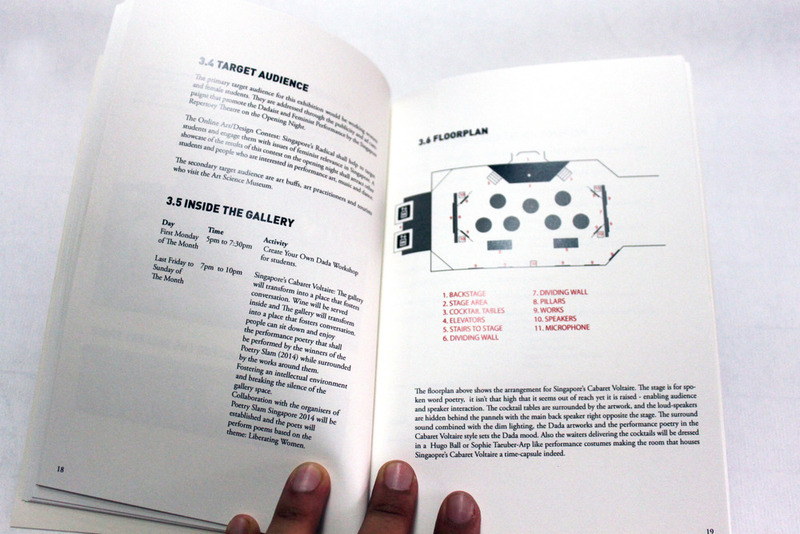 Also an investigation into the methods and the processes involved in curating an exhibition from learning about the importance of publicity and well thought out floor plans to budgeting and proposing the exhibition to the National Arts Council. You can flip through and read the entire proposal in the image carousel alongside.